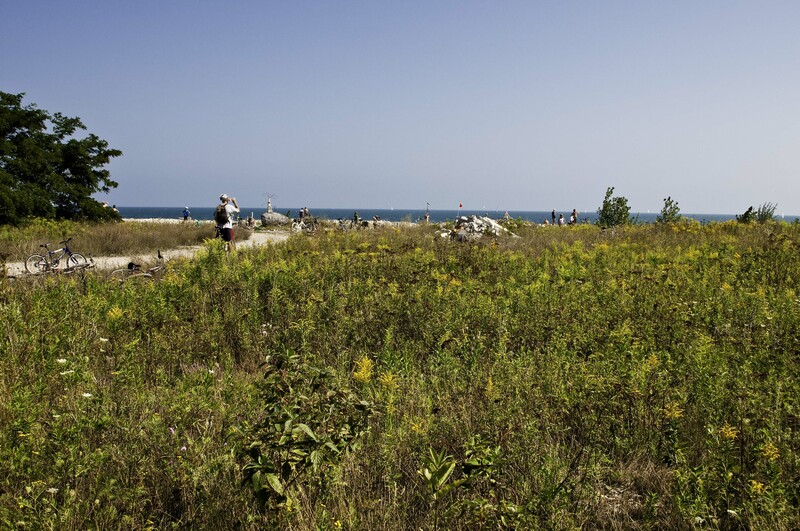 Tommy Thompson Park in Toronto forms part of the Leslie Street Spit, a 5km finger extending out into Lake Ontario originally built to protect the outer harbour. I live nearby, so on the holiday Monday of the Labour Day weekend, I set out on my bike, camera in my saddlebag, to make the round trip on another beautiful sunny day. The park is really a construction site so it is only open to the public during the weekend. What I mean is that it is used as a place to dump clean landfill from construction sites to continue building the spit, making for a steady stream of vehicles during the week. A funny thing happened since it started in the 1950’a – nature started to move in and now it is a conservation area for wildlife. Although on this particular day, the only wildlife I saw was the heavy traffic of families out enjoying the ride/walk to the lighthouse at the end of the paved road. 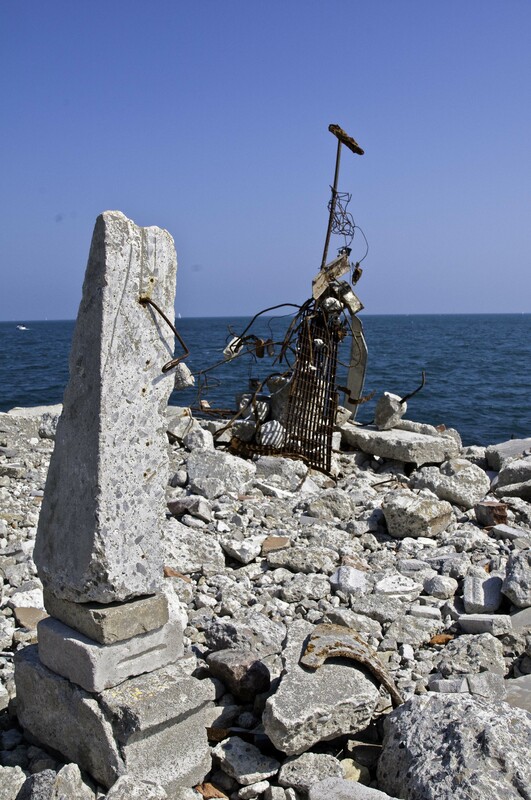 When you reach the end, you see a shore littered with large pieces of concrete and rebars (those metal bars used to reinforce concrete). A stark contrast to the beaches not too far away. 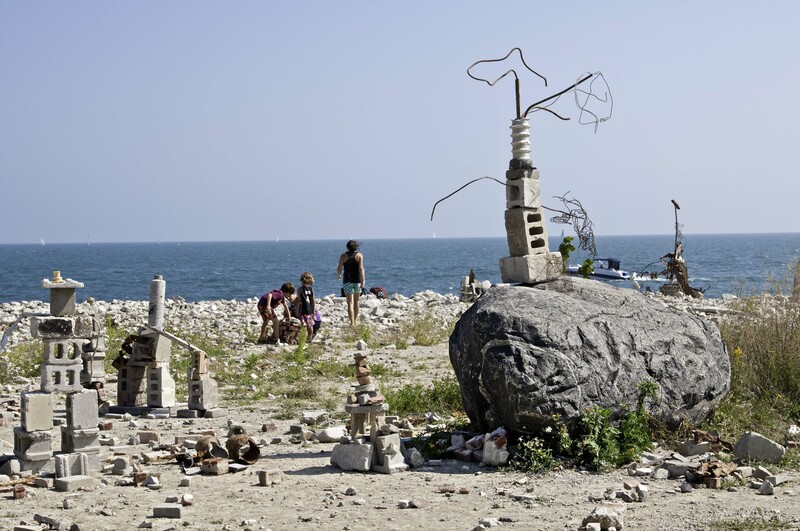 The families that make the trip have made the best of the situation and have created all sorts of statues and artistic displays of the debris making it a rather interesting “artistic” view. It is a nice trip, experiencing the breeze from the lake, the sailboats all around the spit and a rest at the tip. You can wander off the path and explore some of the marshes, birds and wildflowers. This entry was posted in Nature and tagged coast, Leslie Street Spit, nature photography, outdoor photography, photography, Tommy Thompson Park, Toronto. Bookmark the permalink.